So, I know on the podcast there’s a lot of discussion about the internet and its effect on us as a culture, society, what have you. At this point, I almost feel I’m getting redundant. Of course, at the same time, I feel that the fact that it comes up so often in conversation says something—how it has changed daily life, communication, and creativity. My guest today is another artist who touches on themes of the digital world. Today’s episode is a discussion I had this week with LVA‘s Outreach Programs Coordinator Ehren Reed. Ehren is a mixed media artist now based in Louisville. Before moving to Louisville, she studied in both Ohio and San Fransisco, where she started work in arts education and outreach. Ever since, Ehren has been deeply involved in community based programs. Ehren’s artwork explores themes of the intangible, such as memory or digital media. Both of which have a ghostly quality that appears to be there and not at the same time. 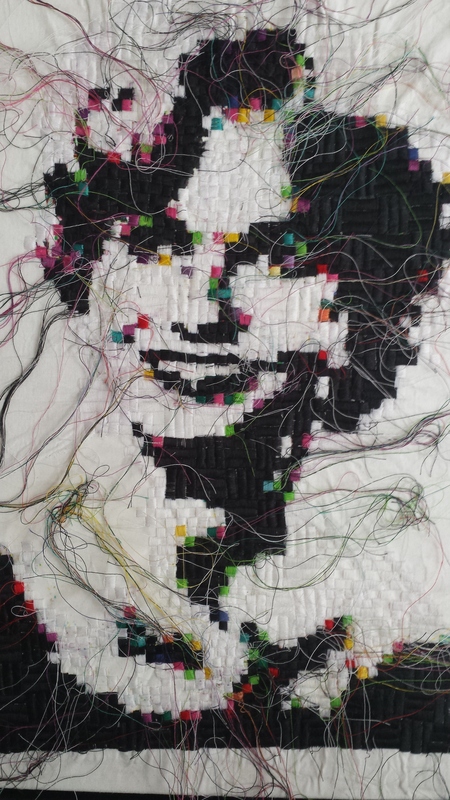 With her work she makes sense of this, and gives substance to such things by creating mixed media pieces involving embroidery, stitching, and old photography or digital images. Listen in to our conversation below as we discuss her jump from painting to embroidery & book making, go on and on about StudioWorks, and try to figure out the internet. To see what Ehren has been up to, art wise, check out her website ehrenreed.com. Click the player to listen to our discussion.